Everything you need to relax and enjoy yourself is right at Maplewood. The view, swimming, fishing, skiing or snowmobiling are only a few steps away. Test your skill in our gameroom, it is open from May through October. 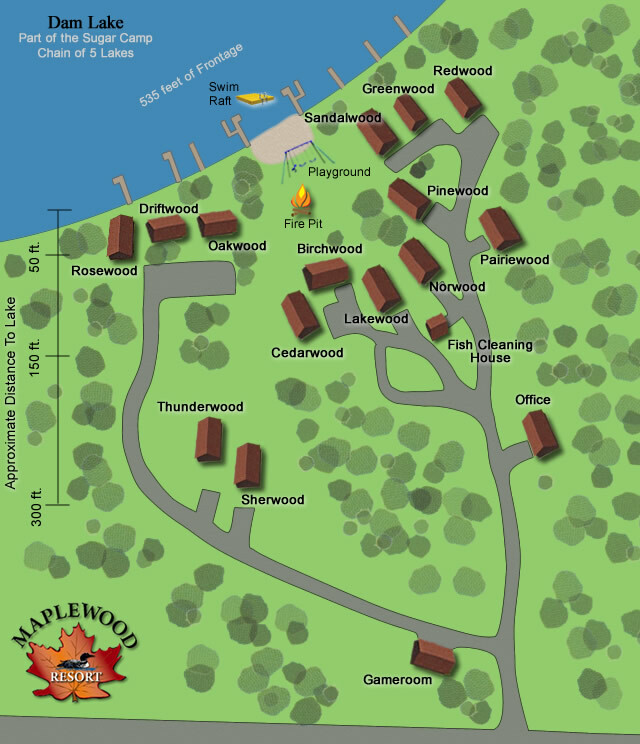 The Sugar Camp Chain of Lakes offers exceptional muskie and walleye fishing. Together the 5 lake chain comprises hundreds of acres of fishable water. We offer special packages for fisherman on a year-round basis. Ice fishing, fall musky fishing, or early season openers call for our special deals! A screened fish cleaning house with running water and lights is available for cleaning the days catch. Maplewood offers a great sand beach for swimming and sunbathing. 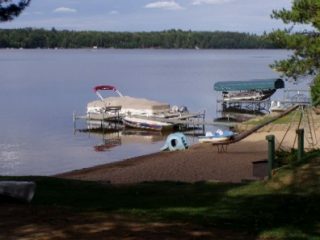 Because Dam Lake is mostly sand, you can run and jump right off your pier at any of our vacation homes and go for a summertime swim. Many quality golf courses are located within a short distance of Maplewood. For a comprehensive list of some of our favorites visit the links page. We also offer special golf packages for customers. If you are intersted in a golfing get-away at Maplewood give us a call! 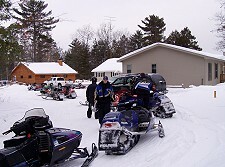 Maplewood lies smack-dab in the middle of hundreds of miles of groomed snowmobile trails from Three Lakes to Minocqua, Saint Germain to Sayner. Park your car, you won't need it, because everything is just a short ride away.